Here’s something a little different – a sweetened dough from the Nordic countries, particularly Finland. It’s the Northern European version of brioche, a bread dough packed with butter and sugar, stuffed with a variety of fruits, creams and spices, as the baker sees fit. Pulla buns are best made as enormous, fist-sized wedges, each looking just that bit too big for a single person to eat. There needs to be some heft to them, enough to provoke a faint gasp from the recipient. Don’t be shy of shaping these buns on the large size. As with most breads and doughs, pulla dough is best made the night before and allowed to rise and ferment overnight in the fridge. The benefits of a long, slow fermentation are incredible, and it’s the investment of this extended period of time to allow the dough to develop a character and complexity of its own that divides good bread made properly from commercial loaves and doughs made badly. And by ‘badly’, I mean ‘quickly’. There’s nothing unusual about pulla dough. It has everything you’d expect to see in an enriched dough, with one extra ingredient – ground cardamom. Cardamom is widely used as a spice in baking across the Nordics, and it’s often found in traditional Christmas pastries. It has that distinctive taste of winter to it, a fiery pang that sits somewhere vaguely over there with nutmeg, mace and cinnamon. In this recipe, the seeds are crushed rather than completely ground, so that there’s a degree of bite left to them. Make the dough by mixing together 500g of strong white bread flour, 7g of salt, and 90g of sugar. In another bowl, mix together 55g of tepid water and 195g of warm milk, and dissolve 15g of dried yeast in it, then leave it aside for the yeast to activate. Extracting cardamom seeds from their pods is a time-consuming, and frankly quite boring exercise. The best way is to bash a handful of pods around in a pestle and mortar for a bit, then pick and tease out the seeds, transferring them to a clean bowl. When you’ve got five grams worth, which is more than you’d think, grind the seeds until they’re smashed up into small pieces, but not necessarily ground to a powder, then add the cardamom to the dry ingredients. Mix the milk, water and yeast into the flour, and bring it together into a dough, kneading for eight minutes until the dough is smooth and shiny. Add 90g of softened butter to the dough and carry on kneading. Things will look a touch disastrous, as the butter smears all over the work surface and your hands … just keep going and you’ll hit a point where the butter just seems to give up fighting and starts to melt into the dough, leaving it soft and smooth. It feels rich. Put the dough in a covered bowl and leave it in the fridge overnight. The next day, roll the dough out into a rectangle about 60cm long by 40cm wide. You can fill the pulla buns with whatever you like, but dried fruit like sultanas or raisins liberally sprinkled over the dough, dusted with cinnamon and Demerara sugar is a good place to start – cover the whole rectangle, right to the edges, and roll it up into a Swiss roll-type shape along the longest edge. Cut each bun out at a forty-five degree angle. so that they’re shaped like stubby triangles. Leave the buns to prove for an hour, then brush them with beaten egg, sprinkle with more Demerara sugar and bake for fifteen to eighteen minutes, or until they’re golden brown. Eat with lots of coffee. 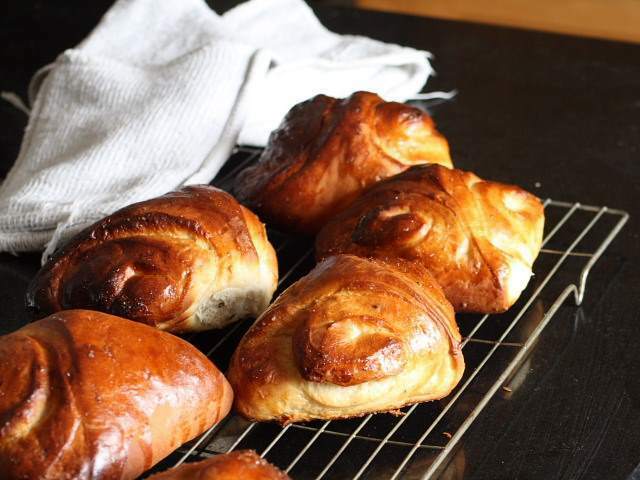 How fun that you have tried the Finnish pulla! The most traditional way is to actually spread some butter, caster sugar and cinnamon to the dough before rolling it. The dough is then cut pretty much how you describe above. Sultanas or raisins are usually added to the dough directly and then shaped into little buns or rolls. Finely ground cardamom is by the way widely available in the Finnish grocery stores so we’re lucky that we don’t have to bash the seeds out of the pods everytime we bake pulla. The recipe is otherwise correct, but the shape looks a bit off to a Finn. Once you’ve cut them into the shape, you have to stand them up on the wider end with the cuts to the side, make a v with your littlefingers and push down so the cut side squeezes out. Makes for a much more beautiful shape (again to a Finnish eye). Also, as Liisa already pointed out, brush with melted butter (or margarine or oil) before spreading caster sugar and (liberal amounts of) cinnamon. These are called korvapuusti. Pullas are usually a basic round shape with sugar sprinkled on top. Though that’s mostly to a person from the Tavastia-area, I suppose. I’ve bought cardamom seeds minus the pods precisely for such occasions when I can’t be bothered to deseed them myself… It’s expensive, but worth it! 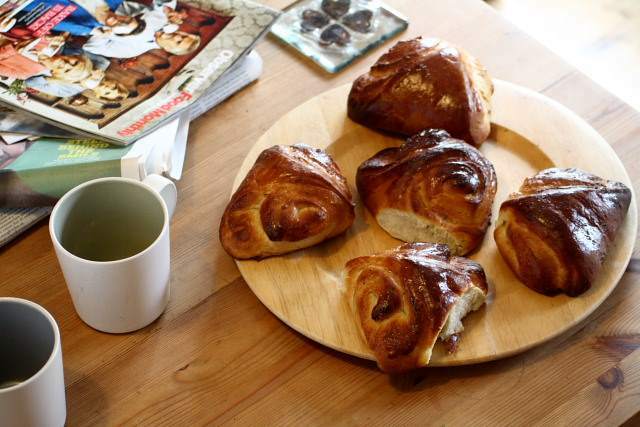 I’ve been to Sweden and had some fantastic cardamom buns there. What a great kick of sugar and cardamom! Brilliant with coffee. I shall have to make some at home now.